It was closed when I saw it but the name engraved on top made me think that wasn't just a decorated room entrance or something like that. Indeed, there was an explanation on the wall around the corner. 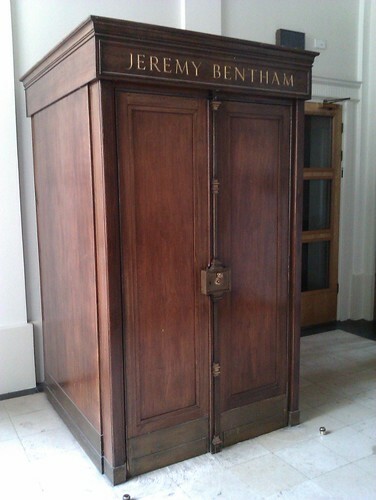 Inside, there is a hay-stuffed figure of Jeremy Bentham himself with his real skeleton serving as a frame. Jurist and philosopher, Bentham had very progressive views, especially for his times, so he didn't believe in life after death and stated in his will that his body should be used for the scientific and educational purposes. However, it proved an irresistible target for students, especially from King's College London, who stole the head in 1975 and demanded a ransome of £100 to be paid to the charity Shelter. UCL finally agreed to pay a ransome of £10 and the head was returned. On another occasion, according to legend, the head, again stolen by students, was eventually found in a luggage locker at a Scottish Station (possibly Aberdeen). The last straw (so runs yet another story) came when it was discovered in the front quadrangle being used for football practice, and the head was henceforth placed in secure storage. I should say that I now have a strong respect for that man!